Hi again! I'm back to share another card I created today. This one is a birthday card for another cousin who celebrated her 7th birthday on Wednesday. 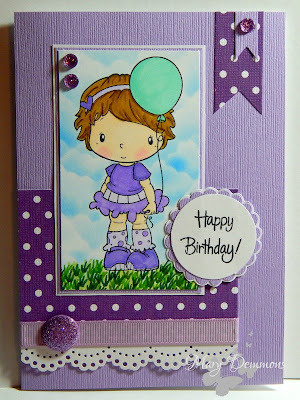 The image I used is Rose With Balloon from CC Designs. I colored the image using Spectrum Noir pens. The sky background is done using a blue ink pad and a cloud stencil. I combined the sketch from Stick It Down with layers of card stock, ribbon, punching, gems and a button to finish the front of my card. Beautiful card and great coloring. Thanks for joining us at Stick it Down. Mary that is completely adorable! Thanks for using the sketch and joining us at STICK IT DOWN! What a cute card! Thanks for playing along with Stick It Down! What a cute card. I love all the purple. Your cousin must have been thrilled when she received her special card. Thanks so much for joining us at Stick It Down. Such a sweet card and such lovely colours. Thank you for joining us at Paradise of Stamps, good luck and I hope you will join us again. Such a sweet card! Thanks for joining us at www.7kidscollegefund.com! Precious, purple, perfection! Thanks so much for getting inky with us this week at Addicted to Stamps and More, hope you will join us next week for our Holiday challenge!!! She's a cutie! Thank you for playing in our challenge at http://www.7kidscollegefund.com. Lovely colouring and it suits the sketch perfectly. I hope to see more of your work in the future over at Stick It Down. 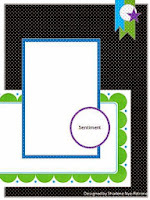 What a pretty card, love the colours and the cloud stencilling. Thanks for playing with us at Stick It Down.